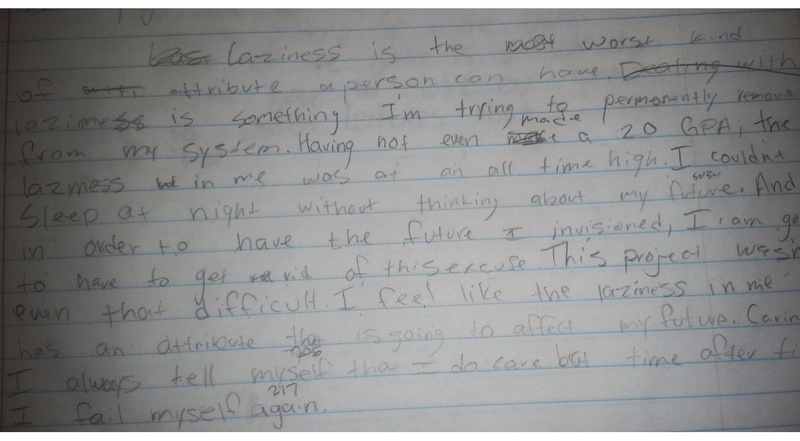 After reading through all of the reflections my students wrote after their WW2 speech projects, I found their responses fell into three general categories: (1) falling on my sword, (2) recognizing our class culture, and (3) the laziness factor. Although an alarming number of student refused to read their speech in class, approximately, two-thirds of my students delivered in front of an audience. They saw good speakers, they saw nervous speakers, and they saw several awe-inspiring, incredibly charismatic speakers. All students were asked to complete a 30-minute reflection describing how they approached the project. A colleague, Bill Chapman (@classroomtools), asked me to analyze the reflections of the students who did not complete their speeches. I did not want to do this. I was ready to move on. After conducting this exercise, I am so grateful that Bill nudged me because I was ready to give up on some of these students. However, the act of reading and classifying the reflections pushed my thinking and I am ready to double-down on engaging these students (and parents) over the last few months of the school year. 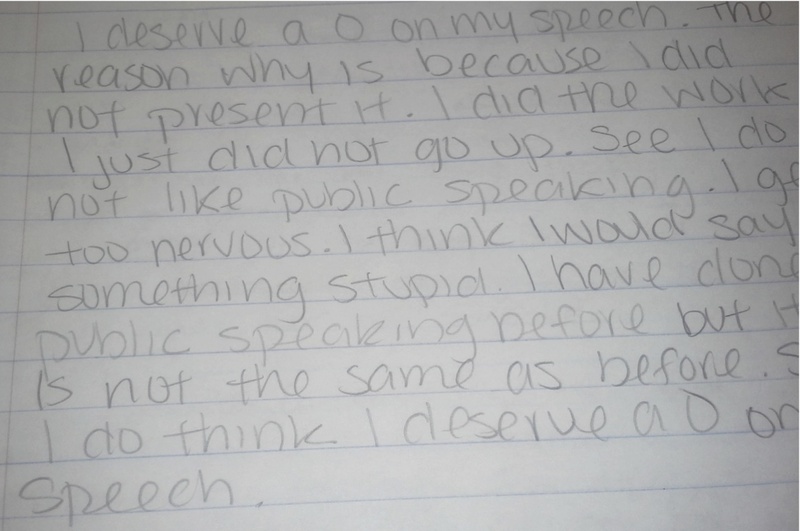 The “I deserve a zero” appeal was utilized by many students who had completed all of necessary the components for the speech, but then lacked the confidence to go up and perform it. Quite a few of my students fell into this category. Many openly stated that they would rather earn the 100 extra-credit points for a Courage to Care essay assignment than go up and deliver their speech. In retrospect, perhaps these students deserve an A for cost-benefit analysis skills. This student utilized what I call the “falling on my sword” approach. Perhaps by accepting blame, the teacher will have mercy on me? This brown-nosing skill will no doubt prove valuable later in life, but it is unlikely to help the student pass classes with firm deadlines. I am glad the student recognizes that it is still not too late to improve his grade. The consequence for not delivering the speech in class means that students now have to deliver the speech to me outside of classroom hours (at lunch or after school). At some point, this 9th grader will learn that it is easier to finish his work on time than to chase me all over campus. 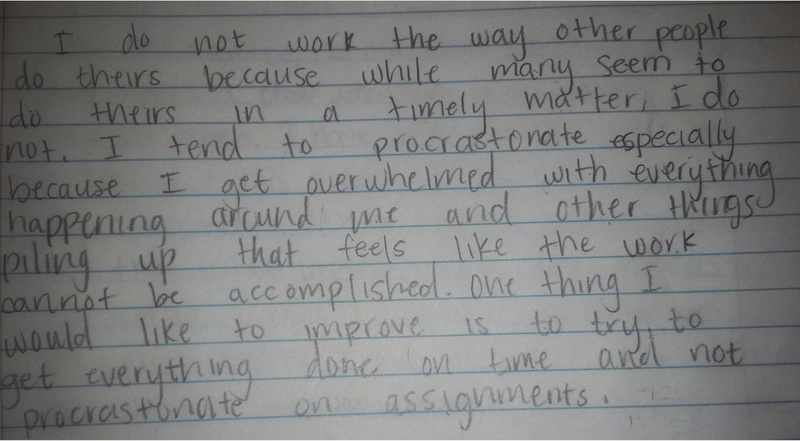 This student has listened to my mantra of… turn in something, anything… most teachers will be forgiving and allow you to revise a poor assignment, but they will not allow you to do that if you miss the deadline and turn NOTHING in. I have experienced this many times in my academic career. Teachers don’t want to hear excuses why you couldn’t do it, but show us you cared enough to put in some effort and we may just give you the benefit of extra time. This student gets some bonus points for recognizing that we spent three weeks of class time on this project. They acknowledge that the assignment was important to everyone’s grade, yet despite this keen insight, they still didn’t do it. I guess admitting you have a problem is always the first step. This brings us to our next category. “Laziness is something that I am trying to permanently remove from my system” leapt off the page. A cogent thought from an articulate student capable of doing thoughtful, grade-level work. A couple of things haunt me about this statement: (1) I have sat across from failing students and their parents countless times over the last decade of my teaching career. “He’s lazy,” say the parents, hoping I know the cure. The student nods “I’m lazy,” and adds a smile as if he’s now got an excuse for never doing any work. He has met and exceeded the parents’ low expectations. In truth, neither party knows how to solve the laziness question, which as it turns out is simply poor time management skills. (2) Both the student and their parents seem to be equally powerless in solving the laziness problem. How can students learn that hard work leads to opportunity if the parents have not committed themselves to addressing this issue? Here, the procrastination proclivity pops up again and reminds me that teaching time management is just as vital as teaching content. Assigning project-based work where the students have a degree of control over what and when they produce may do this type of student a disservice. Explicitly showing students (and some parents) how to use a calendar, how to block out time, and how to reward oneself with cell phone, computer, and/or video game time after steps in a project have been completed may be a starting point. Sending home phone call/text reminders through an automated service like Remind may reinforce time management skills and create habits that students could use for the rest of their lives. Does anyone else have ideas for solving this vexing problem? Like I stated in my previous post, 64% of my students delivered a speech in front of the class. Of the 71 students who elected not to deliver their speeches in front of the class, not one chose to video themselves making the speech privately. The range of students who chose not to deliver a speech (1, 13, 16, 17, 24) varied significantly from class to class. This surprised me. 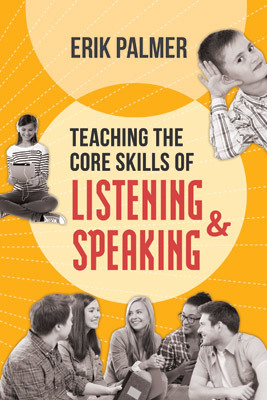 The fact that many students who completed each component of the speech did not want to give a speech in front of the class made me speculate that: (1) public speaking in front of their peers is something students do not want to do and (2) other teachers aren’t assigning individual speaking tasks to their classes. I loved this criteria chart from the MT blog. My feedback centered on speaking style, physical presence, and then content. After the student finished their speech, the class would grade it on a scale of 6-10 in terms of how much the speech interested them. I tried to provide warm feedback. Next time, do less reading and try to make more eye contact with the audience. Don’t play with your hair or tap your foot as you are speaking. Then, I had the students write for 30 minutes assessing their performance. These reflections provided me with a great deal of insight into who had taken the project seriously and who did not. There are four student examples in italics below followed with my interpretation of their comments. For this kind of work, I know I have gotten better in at least three ways. One way I’ve gotten better is because I now know how to grab the attention of the audience with my introduction. The second way is that I connected with my topic in an emotional way that helps make my speech more interesting. Lastly, I found out how to put the right amount of facts and information so it was at least a three-minute speech. This student wrote a 230 word reflection that indicated how good she felt about her speech, which opened with a personal story about the demise of her family’s business and then segued into The National Boycott of Jewish businesses. 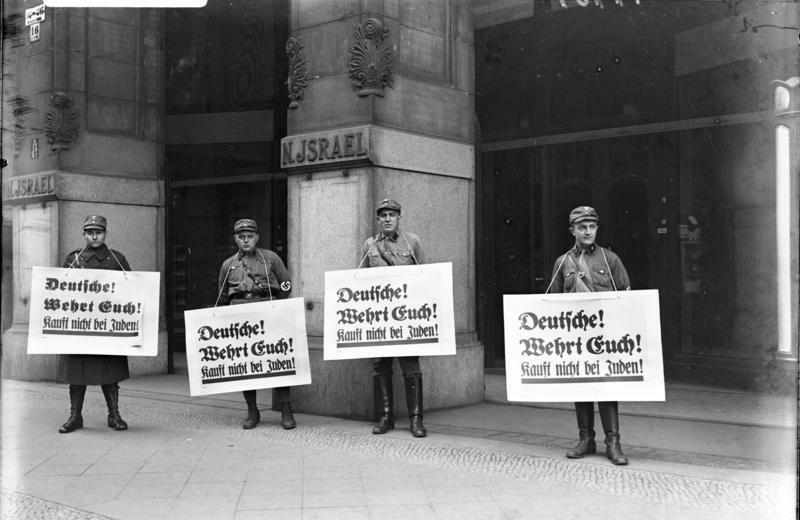 This student made the audience care about when happened to her family and, in turn, the audience thought about all of the hard work and effort that German Jews had put into their family businesses, which were ruined after the boycott. It was a great example of how to connect with an audience. In my opinion, I did a very good job on my work. I specifically like that I had a good opening and closing. One thing I did not like was that there were not many facts. 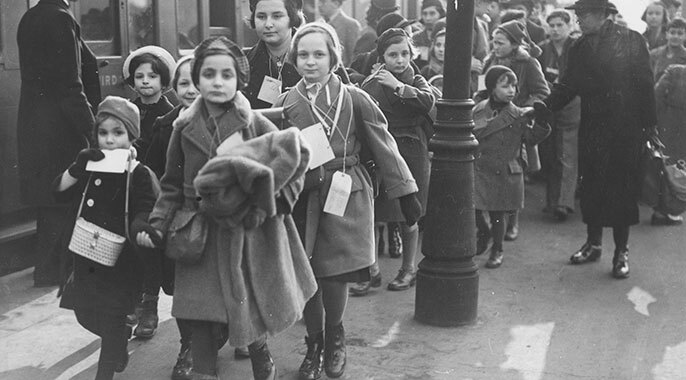 I could have put more information on some of the children in the Kindertransport. I enjoyed that many people liked my speech. This student wrote a 368 word reflection that described how she wanted the audience to feel when they heard her speech. She wanted the audience to develop an emotional attachment to the children of the Kindertransport and did that superbly by asking the audience to imagine what it would be like to lose your parents at four years of age. Throughout the year, I have written multiple speeches. Each time I write one and say it in front of a group of people, I see a change in myself. Especially at the beginning of the year, the first speech I had written was lengthy and it had too much detail. The changes that I see from the speech are the ability to connect to the audience, create a purpose, and the ability to speak in front of people in general. 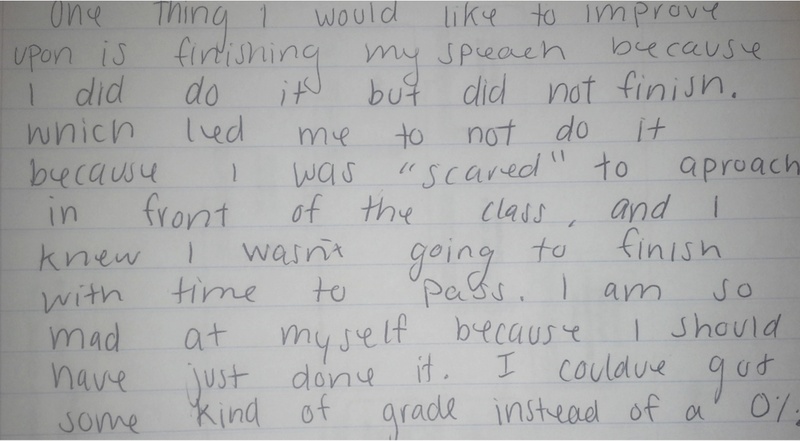 This student wrote a 558 word reflection that detailed how she had learned to craft her speaking style after participating in our school’s Academic Decathlon program. Our school’s Aca Deca coach is a wonderful English teacher who brings medals back to the school, year after year. She is gifted at teaching public speaking, so it didn’t surprise me that this student had a well-developed opening. 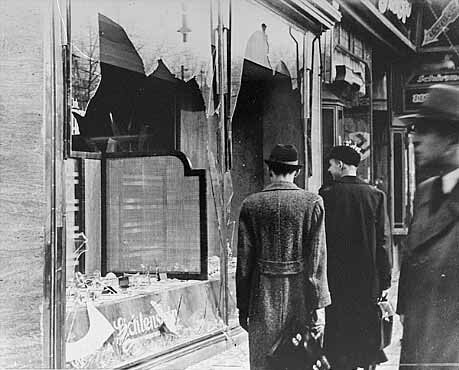 The student spent the first 90 seconds of her speech putting the audience into the events of Kristallnacht. 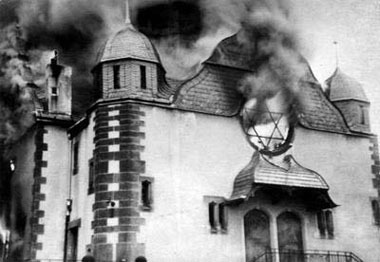 Through eyewitness accounts, she made the audience visualize Jewish children crawling out of the wreckage of a burning hospital over broken glass while the doctors and nurses trying to save them were beaten to death by vicious, anti-Semitic crowds. Then she layered in the facts that led up the event and concluded by giving the audience clear directions in how they should respond whenever they witness acts of religious or racial intolerance. The audience was putty in her hands. I only wish her parents and the school superintendent were in my class to witness the speech. It was fantastic. My work was a lot different than others because my speech was very unorganized. In my speech I had a lot of names that I couldn’t say and even if I did say then, I would say them wrong or not even say them at all, leaving a dead spot in my speech. Most of the class was reading every word off their paper or their phone and I was one of them. The students who had their speech memorized really stood out. I was very confident and loud reading my speech at home, but got very shaky and nervous in front of the class. My legs were shaking and I couldn’t speak correctly and I would want to correct that. This student learned more from watching the other speakers than I could have ever taught him. I didn’t need to give him any feedback. Common Core writing standards require History/Social Science teachers to become writing teachers. Yet many are uncomfortable in this role, they are more accustomed to being experts in their content area and K-12 writing is a foreign language reserved for ELA teachers with their own glossary of terms and acronyms. 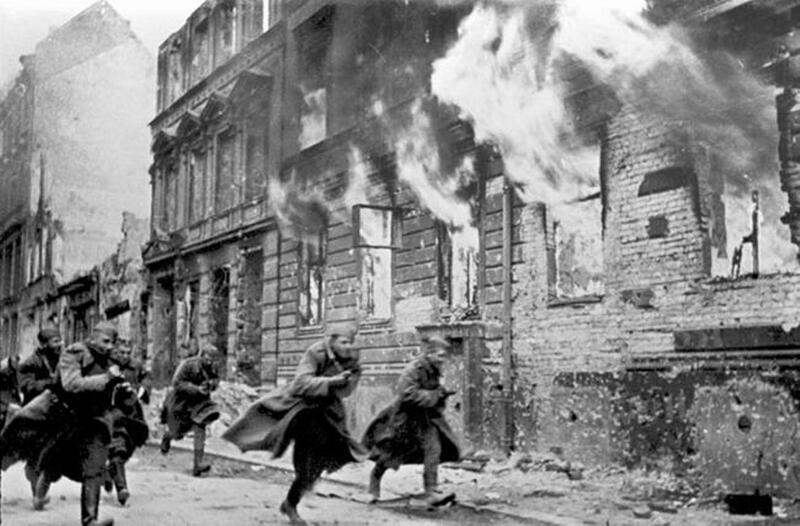 This post will demonstrate how History teachers can continue delivering content while coaching good writing skills and creating positive classroom attitudes toward writing. 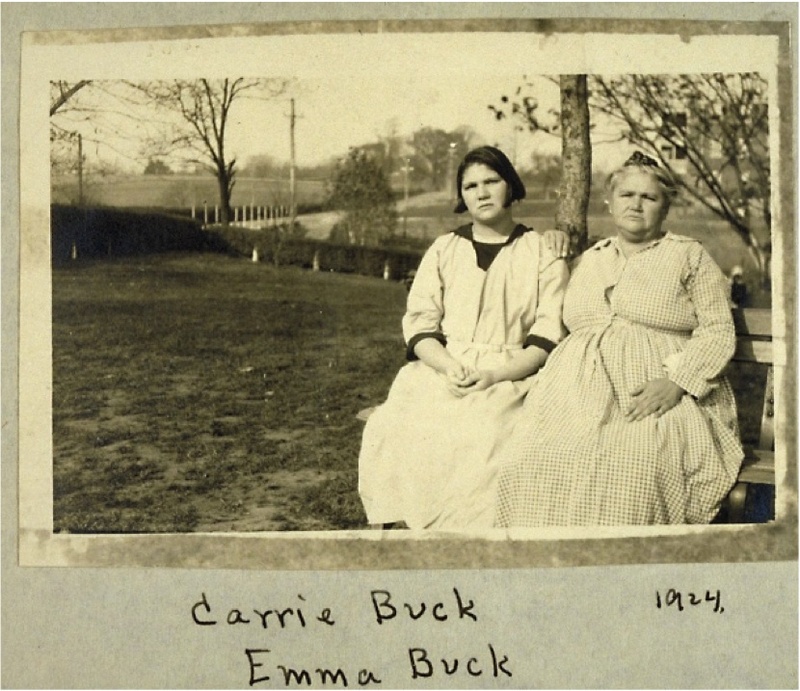 This argumentative writing task on eugenics tested students in three ways: (1) interpreting and gathering evidence; (2) developing a thesis, and (3) supporting their thesis. After listening to a lecture on eugenics, students did a quick write where they took a position on whether eugenics was positive or negative, then they conducted a gallery walk where they collected evidence that supported their argument. I was looking to see if any of them changed their position after learning about eugenics research on criminal behavior, ideal families, immigrants, and people with hereditary disorders and mental illness. Lastly, students were asked to take their evidence (notes) back to their desk and explain their rationale to an elbow partner. I have found that having students talk to a partner before beginning their writing gives them more confidence in the subject and lowers the resistance to writing an in-class essay. 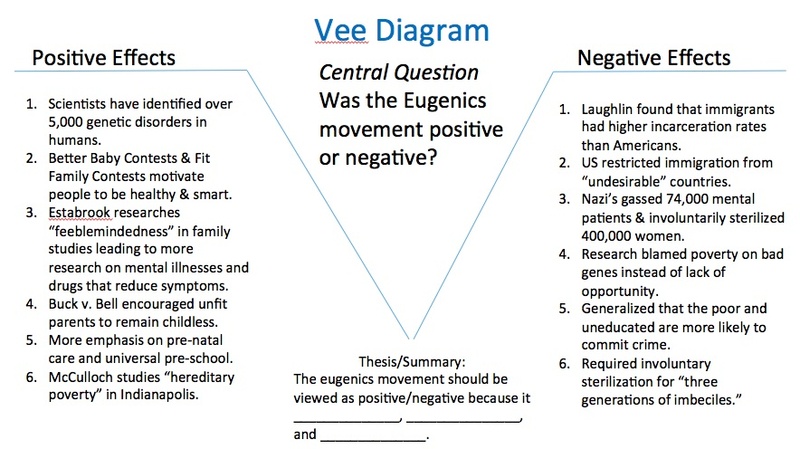 My students were asked to complete a Vee diagram, which provides structure for developing an argument. 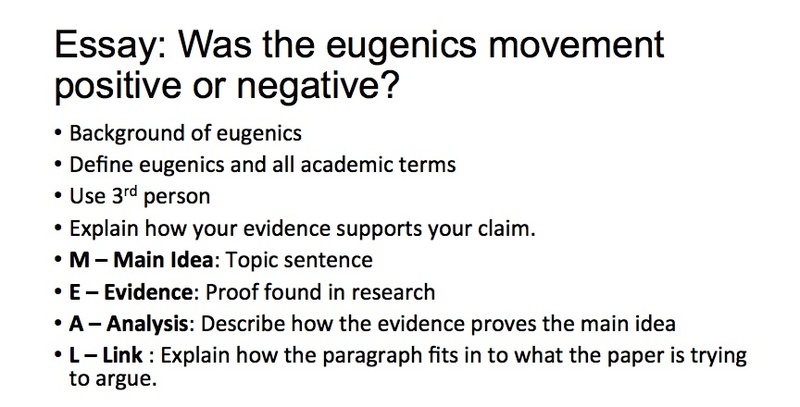 Students write the central question, collect evidence that supports, or argues against it, then they summarize their argument in a thesis sentence at the bottom of the document. I encouraged students to collect six pieces of evidence, so they could include a robust set of claims and counter-claims in their essay. The level of effort they put into the gallery walk was evident in their papers. While only 142 out of 197 or 72% of my students completed this task. These students wrote an average of 292 words with 2.7 claims and 1.6 counter claims. 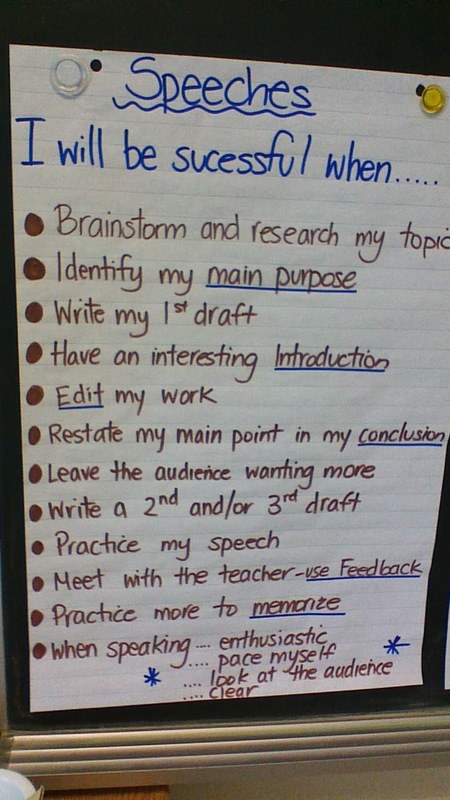 When using goal-setting strategies to motivate students and develop positive attitudes about writing, it is important to give students attainable goals. I told them that I expected 300-400 words, three claims, and two counter-claims. Most of the students met this bar. Unfortunately, this assignment coincided with a tragedy where a student at our school was killed in a traffic accident walking home. The students who knew him were devastated and unable to focus on this assignment, so for grading purposes, I awarded points to all the students who completed the task, but did not penalize students who performed at a sub-par level or did not complete the assignment. As History teachers increase the number of writing assignments in their classrooms, many of these assignments need to be low-stakes, skill-builders. Teachers cannot read and provide quality feedback on 200 essays per week. The following video showcases a high-level example and a low-level example, plus a paragraph that I asked students to repair (revise) and share with an elbow partner. While many Social Studies teachers object to taking instructional time away from delivering content, the Common Core standards tell teachers stop sprinting through the history standards on the coverage model treadmill and explicitly teach writing skills to our students. Districts and schools need to implement professional development seminars that help teachers shift out of their comfort zones as content-delivery experts into new ones as writing coaches.